Head Office Ottawa is an energetic space offering a creative and innovative environment to help you get things done. A membership to our space grants access to communal work space, boardrooms and an on-site bistro accented by beautiful overhead natural lighting to keep you feeling alert and on task. We know firsthand that a work environment can be the difference between a businesses’ success and burnout. From entrepreneur to sales executive and everyone in between, Head Office is a space and environment where people feel welcome, are productive, network with like-minded people, come to work happy, and above all else, drive success. Keep the day’s momentum with an after-business hours networking experience in a casual setting that’s sure to engage. 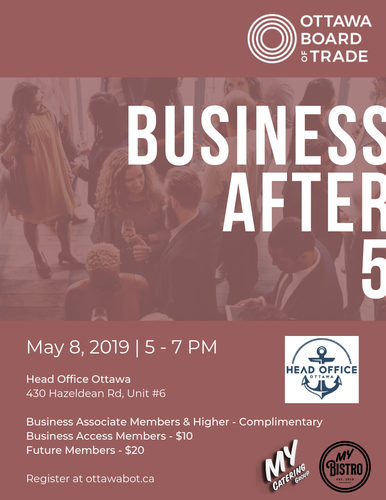 Enjoy complimentary hors-d’oeuvres and drinks as you network with your peers, establish new working relationships and get a better understanding of the challenges facing businesses in Ottawa.